A trove of State Department emails sent from Huma Abedin to a personal laptop may lead to the indictment of former presidential candidate Hillary Clinton, Judge Andrew Napolitano highlighted on Fox Business Network Wednesday. The senior legal analyst discussed a Judicial Watch report from Tuesday showing the FBI found 2,800 official State Dept. emails on a laptop used by Abedin’s husband, disgraced Congressman Anthony Weiner, who was recently sentenced to 21 months in prison for sexting a 15-year-old girl. “The significance is an FBI acknowledgement that Huma Abedin, Mrs. Anthony Weiner, when she had a top security clearance as the number two assistant to Hillary Clinton when Hillary was secretary of state, regularly sent copies of sensitive material to her own laptop so she could look at it at night, either knowing, or forgetting that her husband had access to it as well,” Napolitano summarized. The new revelation, which stems from a May 2015 Judicial Watch FOIA request, should be enough for President Trump to call on the Justice Department to re-open the FBI investigation, which Napolitano says will lead to an indictment against Hillary Clinton. “The evidence will take them to an indictment,” insisted the judicial analyst. Napolitano states an indictment would force Abedin to testify as a witness against Clinton from whom she received sensitive State Dept. emails, which were then compromised when they were forwarded to a laptop accessible by Weiner. “That’s the way the Justice Department works. They are not bound by the ill-advised, politically motivated decision that James Comey made in July of 2016 not to seek her indictment,” Napolitano said. On Wednesday, President Trump commented after learning former FBI Director James Comey drafted his statement to end his investigation into Clinton months before he interviewed the former presidential candidate. President Trump’s voters are disrespected by the US political establishment that’s constantly blocking the president’s agenda, said Russian President Vladimir Putin who also blamed the “Russian collusion” narrative on Hillary Clinton. Interestingly, Putin spoke about Bill Browder, an American-British financier who was tried in absentia in Russia for tax fraud in 2013 and later told the US Senate Judiciary Committee that Donald Trump Jr. met with a “Russian agent” during the presidential campaign. And the Russian president believes Trump’s supporters deserve more respect. In answering another question from a journalist, Putin pointed out that Trump’s incalculable personality is how he reacts to his enemies. A tweet in which an individual ‘joked’ that John Hinckley Jr. should be prepared to go back to psychiatric hospital because “we need him again” to assassinate Trump received over 70,000 retweets and 170,000 likes on Twitter. Hinckley Jr. was released in September last year, 35 years after attempting to kill President Ronald Reagan in Washington DC. Reagan survived the assassination attempt despite being hit in the chest by a bullet that ricocheted off the side of the presidential limousine. Since being posted yesterday, the tweet has received over 70,000 retweets and over 170,000 likes. The Twitter user who posted the tweet – @Simpboyz – links to the Paypal account of a person named Cameron Makell who lives in Baltimore. Users on the original Slate tweet that linked to the article about Hinckley Jr. being released also joked about him killing Trump. “Maybe he can meet our new president,” remarked one. “Drop him off at a gun show and tell him Trump is banging Jodie,” added another – a reference to Hinckley Jr.’s obsession with Jodie Foster. While ‘jokes’ and serious assassination threats against Trump are rampant on Twitter, the fact that this one received over 70,000 retweets and 170,000 likes in less than 24 hours without being removed emphasizes how much of a far-left trash heap the social media network really is. Emma Stone, Julianne Moore, and Melissa McCarthy are among a number of a celebrities that appear in a video urging Americans to “reject the NRA” and concealed carry of firearms in the wake of the Las Vegas shooting this month. Bill Hader, Adam Scott, and Cheryl Crow also make an appearance in the anti-gun campaign, which is part of the Michael Bloomberg-funded Everytown For Gun Safety PSA that targets the NRA specifically, then going after silencers and basic gun rights. The cringeworthy video begins with virtue-signaling jargon and no real solutions related to the Vegas attack. After all, gunman Stephen Paddock passed all background checks, complied with all gun controls, and didn’t even use silencers in the first place. “The mass shooting in Las Vegas has all of us grieving, scared and angry,” Stone opens the video. Other celebrities then appear with instructions about how to push back against gun rights. “– Right now, that only takes 5 minutes of your time,” says Elizabeth Banks. More celebrities appear to say, “Text REJECT” to the Everytown group. They tell viewers that the gun control group will call those who text, give them contact numbers for their congressmen, and talk them through what to say when they call. They also bring up the SHARE Act, urging Congress to oppose it. This is legislation that would remove a federal tax from suppressors and reduce bureaucratic red-tape that would make it easier for law-abiding citizens to acquire suppressors. It’s worth noting that suppressors and silencers had absolutely nothing to do with the Las Vegas shooting. As mentioned, Paddock complied with all laws and passed all background checks, and no existing law would have prevented such an attack, as noted by gun control advocate Senator Diane Feinstein (D-CA). Why Is Las Vegas Coroner’s Office On Lockdown? Why would coroner need protection is Paddock was the only shooter? Campos appeared alongside Mandalay Bay building engineer Stephen Schuck in a pre-taped interview answering questions about the events he witnessed as he approached the hotel room of alleged shooter Stephen Paddock – who was either preparing to, was in the middle of, or had just finished shooting at Las Vegas country music festival concertgoers depending on which narrative you choose. Tomorrow, the first people to encounter the Las Vegas shooter are here – security guard Jesus Campos and building engineer Stephen Schuck. “I’m doing better each day, slowly but surely. 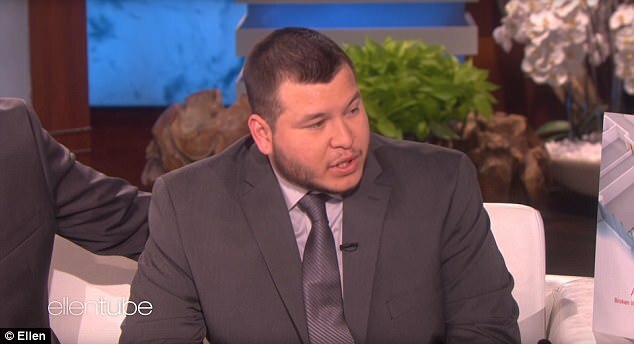 Just healing mentally and physically,” Campos told DeGeneres, 17 days after the massacre. Campos said he instead used an elevator to access the floor and described distinctly hearing “drilling sounds” as he neared the shooter’s room via a hallway, which is how he believes Paddock may have observed him. Police have claimed the shooter set up surveillance devices outside of his hotel room. DeGeneres used a pointer and a diagram to depict to her audience what Campos was describing. Schuck says he arrived at the floor unaware of gunfire and heard “jackhammer sounds,” as Campos popped out from a corner telling him to take cover. “Within milliseconds, if he didn’t say that, I would’ve got hit,” Schuck said. 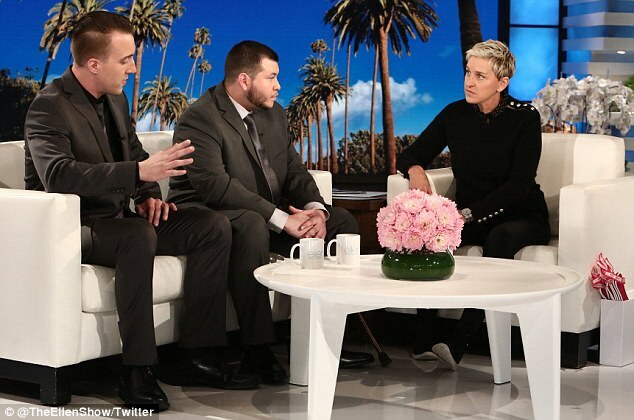 Ellen went on to lavish Campos with praise for saving peoples’ lives, and offered them both reward money, which Campos and Schuck supposedly declined, instead opting for free NFL tickets. Campos’ account did little to answer numerous questions surrounding the event, despite high expectations his side of the story could help shed light on an ever-shifting narrative continually altered by law enforcement. Twitter users expressed incredulity that the guard would vanish only to appear not at a press conference with police, but with Ellen. This guy has been missing for days??? We all have questions and now he is going to appear on a daytime talk show??? This is very bizarre. This is not the forum for this type of event. This is alarming and what is he hiding? He needs to assist in collecting info not prosper. The security guard had been scheduled for five television interviews last Thursday, but bailed even to the surprise of his labor union president, who claimed Campos disappeared from one moment to the next. “We were in a room and we came out and he was gone,” the union president told the media. “For the past four days he’s been preparing… we had a meeting with MGM officials, and after that meeting was over, we talked about the interviews, we went to a private area, and when we came out, Mr. Campos was gone,” Security, Police, and Fire Professionals of America union president David Hickey elaborated in a statement to reporters. The union president says he was notified via text that Campos had been taken to a UMC Quick Care emergency care facility, however a spokesperson for the clinic told Fox News they had no record of his visit. In a statement to the media Tuesday, representatives for MGM Resorts International said, “Jesus Campos wants to tell his story at a time and place of his choosing,” and that “He’s asked that everyone respect his request for privacy. We could not be more proud of Jesus.” MGM Resorts International owns Mandalay Bay. Campos was hailed as a “hero” in the days immediately following the shooting. The security guard was at the center of controversy after law enforcement issued dramatic shifts in the timeline of the Vegas narrative, initially claiming Campos disrupted Paddock 10 minutes after he unloaded gunfire onto a crowd of 20,000 festival-goers. As noted on the Wednesday edition of Real News with David Knight, Ellen has a line of IGT slot machines available at the MGM Grand hotel and casino in Las Vegas, and debuted them on a segment of her show. On an interesting side note, there is an Ellen slot machine at the Mandalay Bay casino as well.